Tantrums! Tantrums are NO fun. But did you know there are ways to stop a tantrum in its tracks? I do not jest. Here are some things I do when I have a young one starting a tantrum. When I was growing up, personal indulgence in a “wo is me” monologue was never entertained. My parents came from poor upbringings and so throwing any sort of fit over things seemed rather spoiled and, well, dumb. I think I have taken the experience from my childhood and applied it to my methods today. These are all methods I use to stop a tantrum. I don’t do each one each time and I don’t do any special order. You kind of have to feel it out and go with what you think seems best at the moment. You will find some methods are more effective for different children or different ages. My most common thing to do when I have a little one starting a fit is to lighten the mood. I tickle. I joke. I get them laughing. You don’t have to respond to tantrums with a firm, stern face. What you don’t want to do is give in to the tantrum. So say your child starts throwing a fit because she wants to watch TV and you have told her no. You might start tickling her to get her to “turn that frown upside down,” but you still don’t turn the TV on. The rule stays, the attitude changes. Mimicing seems to work best for the older toddler on into preschooler age range. Sometimes younger toddlers will stop with mimicing, too. Your child starts that fit and you join right in (though I don’t think I ever match the magnitude). This is an extension of my suggestion to lighten the mood. Watching an adult throw a tantrum is quite entertaining. Then the child sees how silly it looks and usually goes from mid-cry to laughter. Sometimes a child just needs to be alone. If your child is having a super grumpy day, do an extra session of Independent Play. Or make sure to get your one session in there. I often find if Brinley is having a grumpy morning, she will come out of Independent Play quite pleasant. As your child throws a tantrum, continue on with your business. If you weren’t doing anything, find something to do. Wipe the counter off if you can think of nothing else. Fluff some pillows. Continue on as though that tantrum isn’t phasing you in the least. Your child often wants some sort of reaction from you. If you react with some strong emotion, your child will feel a bit vindicated. See Substitution: Toddlerwise for more on redirection. Sometimes, even admist all of these awesome tools I just listed, your child will carry on with the tantrum. At that point, I tell the child it isn’t okay. It is okay to be sad or disappointed, but it isn’t okay to carry on and throw a tantrum. If the child wants to continue throwing a tantrum, it will have to be done on his or her bed. The next time you encounter a tantrum, try some of these methods out. Always remember to remain calm–that is your best tool ever. As a former teacher, I can vouch that these suggestions work great with kids at almost any age! One of my other favorite tips is just to be confident and be consistent. My students knew I would not give into their tantrums because I was consistent in the way I handled each one. I often did the "unimpressed" thing – especially with older ones – and just looked at them like they were crazy. That usually worked, haha! That picture of Brinley! How often do I see that same face on my daughter! haha! Great point Katie thanks! Excellent addition. Stephanie–so funny right! She was so mad at me for trying to get her to sit for pictures. This is definitely not an easy age to photograph. aww! is that what it was? I thought maybe she wanted to eat leaves! 🙂 My daughter is a ham. She says cheese for me now! 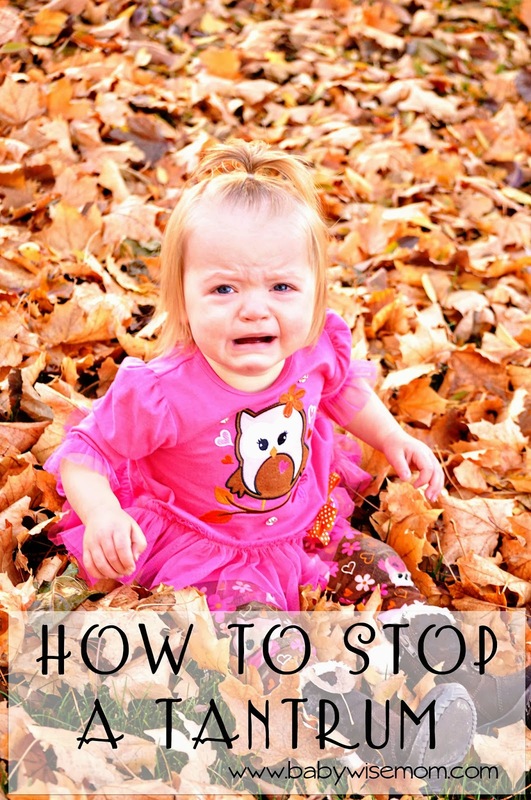 Great tips!I've always ignored tantrums as much as possible! Yes i'm the momin the grocery store calmly shopping while my 16 month old screams his head off. I would love to hear suggestions on how to deal with just screaming. My son is a little delayed (he is 19 months), and I think his lack of verbal words to use, leads him to the blood curdling screams, though not usually a tantrum type situation. Just really loud and high pitched screams. Help?? youhavehowmany.wordpress.com — ha ha! I have been there. I was checking out at Joannes about a month ago while Brinley was doing her mumble tantrum (she rarely is very loud about it at this point in life) and the checker commented that she wasn't very happy. Yep. She wanted something she couldn't have. Heather Collier Have you tried signing? Does he pick up on that? What I have done with children either aren't verbal or are refusing to verbalize (I have had both–and I have had one who started speaking in sentences at 14 months and I can attest a child who speaks well has fewer tantrums), I still expect attempts at communication. He should be old enough to understand what you are saying. So if he wants something but can't have it, you should be able to say, "yes I know you want a cracker right now (and maybe even point to where the crackers are), but you cannot have it right now." Crying is sure to continue, but be consistent about it and so long as he knows he has been heard and understood, he will get better about it with time. That is a good idea for a post on its own.